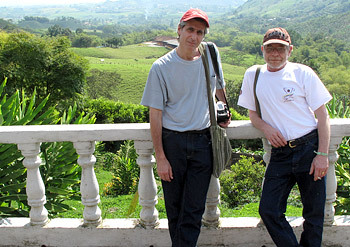 Roastmasters.com was established by Bob Williams and Barry Levine, the co-founders and principals of Willoughby's Coffee & Tea. Willoughby's (established in 1985) is a quality-driven specialty coffee roasting company based in the New Haven, Connecticut area. The company has three retail locations, a centralized roasting plant, and mail order and wholesale customers nationwide. Over the years, Willoughby's has received many awards and recognitions for the quality and freshness of its coffee. Collectively, Bob and Barry have over 40 years of experience in cupping and sourcing the finest arabica green coffees produced. They cup far more coffees of distinction than the requirements of Willoughby's, so Roastmasters.com was an excellent way to put the benefit of their extensive cuppings to use. "Usually, in any given cupping of a particular origin, we find several coffees that we love, but we must chose just one or two in the interest of maintaining a fresh and consistent product for Willoughby's customers. But with the creation of Roastmasters.com, we can secure small lots of many different coffees, be it three or four auction lots of Kenya AA or various Guatemala Antigua estates. We can offer our Roastmasters.com customers more choices and the opportunity to experience the wonderful array of flavors each particular coffee offers." Bob and Barry are among the first members of the Specialty Coffee Association of America, and serve on the Association's Arbitration Panel. They are also members of the Roaster's Guild and the Connecticut Specialty Food Association. They have been continuous contributors to Coffee Kids since its inception.